BERKELEY —The University of California, Berkeley, and UC San Francisco are launching the Innovative Genomics Initiative (IGI) to lead a revolution in genetic engineering based on a new technology already generating novel strategies for gene therapy and the genetic study of disease.The Li Ka Shing Foundation has provided a $10 million gift to support the initiative, establishing the Li Ka Shing Center for Genomic Engineering and an affiliated faculty chair at UC Berkeley. The two universities also will provide $2 million in start-up funds. At the core of the initiative is a revolutionary technology discovered two years ago at UC Berkeley by Jennifer A. Doudna, executive director of the initiative and the new faculty chair. The technology, precision “DNA scissors” referred to as CRISPR/Cas9, has exploded in popularity since it was first published in June 2012 and is at the heart of at least three start-ups and several heavily-attended international meetings. Scientists have referred to it as the “holy grail” of genetic engineering and a “jaw-dropping” breakthrough in the fight against genetic disease. 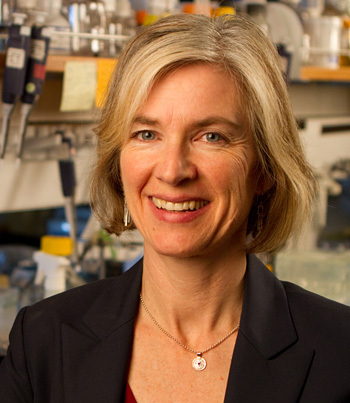 In honor of her discovery and earlier work on RNA, Doudna received last month the Lurie Prize of the Foundation for the National Institutes of Health. THEN, there was development of CRISPR Applications @MIT using a precise way to delete and edit specific bits of DNA—even by changing a single base pair. This means they can rewrite the human genome at will. Over the last decade, as DNA-sequencing technology has grown ever faster and cheaper, our understanding of the human genome has increased accordingly. Yet scientists have until recently remained largely ham-fisted when they’ve tried to directly modify genes in a living cell. Take sickle-cell anemia, for example. A debilitating and often deadly disease, it is caused by a mutation in just one of a patient’s three billion DNA base pairs. Even though this genetic error is simple and well studied, researchers are helpless to correct it and halt its devastating effects. Now there is hope in the form of new genome-engineering tools, particularly one called CRISPR. This technology could allow researchers to perform microsurgery on genes, precisely and easily changing a DNA sequence at exact locations on a chromosome. Along with a technique called TALENs, invented several years ago, and a slightly older predecessor based on molecules called zinc finger nucleases, CRISPR could make gene therapies more broadly applicable, providing remedies for simple genetic disorders like sickle-cell anemia and eventually even leading to cures for more complex diseases involving multiple genes. Most conventional gene therapies crudely place new genetic material at a random location in the cell and can only add a gene. In contrast, CRISPR and the other new tools also give scientists a precise way to delete and edit specific bits of DNA—even by changing a single base pair. This means they can rewrite the human genome at will. This is of course fascinating. Every time I read an article about such work, I hope that it’s an early sign of life-changing breakthroughs at the clinical level for people like my developmentally disabled son. Unfortunately, as the years pass I continue to find an enormous gulf between reports of what might be coming and what is actually available. I’ve contacted researchers only to learn that their research is hurting for money and going nowhere fast. I’ve gone to prominent practitioners and found it impossible even to get a blood draw. @fatherspledge Thank you for your comment – very moving even I do not know you. The problem with such a disrupting research is, that it is further away than “optimists” think it is and that is much nearer than “pesimists” belive it is. I personally think this is a throughbrough I have never read about in the last 15 years or so and estimate that it will take a decade or two before it is broadly available – sorry – but that is my estimate only and could be wrong in both dimensions but I am in the optimistic camp and think this is a real game changer – appologies for not finding better expressions. I’m on the edge of my seat reading this. Absolutely fantastic article. It’s a great time to be alive. The advances in our genomic understanding and tools over the proceeding decade have been incredible and I am always excited to read articles such as this one. I hope that the field maintains its momentum and continues to see modest increases in velocity. Keeping in mind that with great power comes great responsibility, I hope that the discussion is already occurring on how to utilize these tools to minimize the threats of improper use, but I trust the benefits will greatly outweigh any dangers. Great article! Fantastic article – thank you. I would suggest it should be added to the “Best American Science and Natural Writing 2014” anthology, btw. In this acse it would be interesting to see the application to the simpler Mendelian defects – of which, many were described in the early to mid-20th century (Garrod? ), and developed further by Victor McKusick. Much of McKusicks collection was stored at the Armed Forces Institute of Pathology, but where they were transferred – I have no idea. I did review some of the skeletal abnormalities with the late LC Johnson, and I taught that in one lecture of 6. Koch institute RNA Conference on 6/13 at MIT, posted on 6/4/2014.